This month’s security update covers security issues in a variety of Microsoft’s products, including the Chakra Scripting Engine and the Internet Explorer and Exchange web browsers. 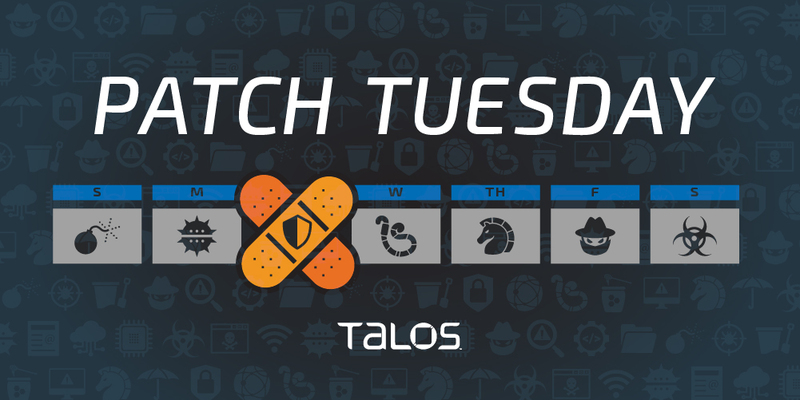 For coverage of these vulnerabilities, read the SNORTⓇ blog post here. Microsoft disclosed 20 critical vulnerabilities this month, 12 of which we will highlight below. CVE-2019-0590, CVE-2019-0591, CVE-2019-0593, CVE-2019-0640, CVE-2019-0642, CVE-2019-0644, CVE-2019-0651, CVE-2019-0652 and CVE-2019-0655 are all memory corruption vulnerabilities in Microsoft scripting engine. The bugs all lie in the way the engine processes objects in memory in the Microsoft Edge web browser. An attacker could exploit this vulnerability to corrupt the machine’s memory, eventually allowing them to execute code remotely in the context of the current users. A user could trigger this bug by either visiting a malicious web page while using Edge, or by accessing specially crafted content created by the attacker. CVE-2019-0606 is a memory corruption vulnerability in Microsoft Internet Explorer. The problem lies in the way the web browser accesses objects in memory. An attacker could exploit this vulnerability by tricking a user into visiting a specially crafted website or user-created content in Internet Explorer. Once triggered, the attacker could gain the ability to execute code remotely in the context of the current user. CVE-2019-0645 and CVE-2019-0650 are memory corruption vulnerabilities that exist in Microsoft Edge when the web browser fails to properly handle objects in memory. An attacker could exploit this vulnerability by tricking a user into visiting a maliciously crafted website in Edge, or clicking on specially crafted content. An attacker could use this bug to gain the ability to execute arbitrary code in the context of the current user. There were also three moderate vulnerabilities in this release: CVE-2019-0641, CVE-2019-0643 and CVE-2019-0670.